By GE. 6 inch chrome drip bowl. Fits GE and HotPoint ranges where a black plastic terminal block is used (solid terminal plug-in surface elements). 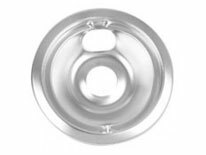 Matching 8 inch drip bowl: WB32X5076. Surface elements: 6 inch WB30M1, 8 inch WB30M2. Element terminal block: WB17X5113.